Norton Die Grinder is designed for wide range of portable grinding applications without need for changing machines. The unit comes with double-bearing spindle and ergonomic non-slip grip. Norton Die Grinder is engineered to make quick work of deburring, light to medium surface cleaning and stock removal applications, welding preparation and finishing in metal fabrication, MRO, foundry, shipbuilding, aviation and automotive industry. WORCESTER, MA, USA (July 6, 2018) – Norton |Saint-Gobain Abrasives, one of the world’s largest abrasives manufacturers, has introduced its Norton Die Grinder, the latest addition to its new professional tool line. The Norton Pneumatic Die Grinder quickly and comfortably accomplishes a wide range of portable grinding applications without the need to change machines. For more information and to download a brochure visit (http://nortonsga.us/diegrindwp). "Our new, versatile die grinder will enhance the performance of numerous abrasive products, including mounted points, flap wheels, traditional specialties such as cartridge rolls, and our new Norton Carbide Burrs,” said Patrick Carroll, Norton | Saint-Gobain Abrasives Senior Product Manager. "We are pleased to offer a one-vendor solution for a perfect pairing of the machine and the abrasive." Operators will immediately notice a reduction in vibrations attributed to the grinder's double-bearing spindle, resulting in longer tool life and finer finishes. Precision is as simple as adjusting the speed regulator, giving the operator complete control of the surface finish needed to complete the job. An ergonomic and streamlined non-slip grip achieves better tool handling, increased comfort and reduced grinding fatigue. The Norton Die Grinder is small and light weight for additional control, with the ability to get into small features in parts. The new Die Grinder has a free speed of 25,000 rpm, designed to make quick work of deburring, light to medium surface cleaning and stock removal applications, welding preparation, and finishing. Key industries for the Die Grinder are metal fabrication, MRO, foundry, shipbuilding, aviation, and automotive. 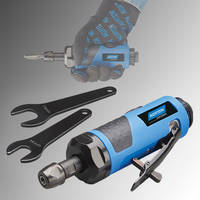 This die grinder is the third Norton pneumatic hand tool recently released by Norton | Saint-Gobain, complementing the previously released 2" and 3" Norton Mini Angle Sanders. The latest Die Grinder is a solid performing product with a good-tier performance and price, and is sold as a single unit, as well as in a kit with select abrasive products. Saint-Gobain Abrasives offers powerful, precise, user-friendly solutions, which enable customers to cut, shape and finish all materials in the most complex and challenging applications. By working closely with end-users and grinding expert partners, Saint-Gobain Abrasives designs and provides customized solutions to secure the best option for performance, cost and safety. Leveraging its global manufacturing presence, Saint-Gobain Abrasives serves its customers locally through its structured sales operations in over 27 countries, employing over 10,000 people.